Ah, pizza. The one food I could eat everyday, for every meal. The one food my grandpop would not eat, even when his army buddies got him drunk. The one food people have very specific likes of: thin crust, thick crust, deep dish, pepperoni, white pies, cold pizza, hot pizza, frozen pizza from the toaster oven, steaming hot right out of the oven pizza. The list goes on and on. Anyone with half a brain can make a pizza. But to make a great pizza requires skill and a really great oven. This brings us to Tacconelli’s. Tacconelli’s is a pizza place in my neighborhood, the Port Richmond section of Philly, on Somerset street. They have a very cool brick oven and they know how to use it. You can’t just pop in there and order a pie. I mean, you can, but it is easier to call ahead and order your dough. You can tell them what to do with it when you get there but you better call ahead, because it’s a one man, one person oven and they only make so much dough every day. Once it’s gone, it’s gone. Needless to say, this makes the pizza desirable, to say the least. 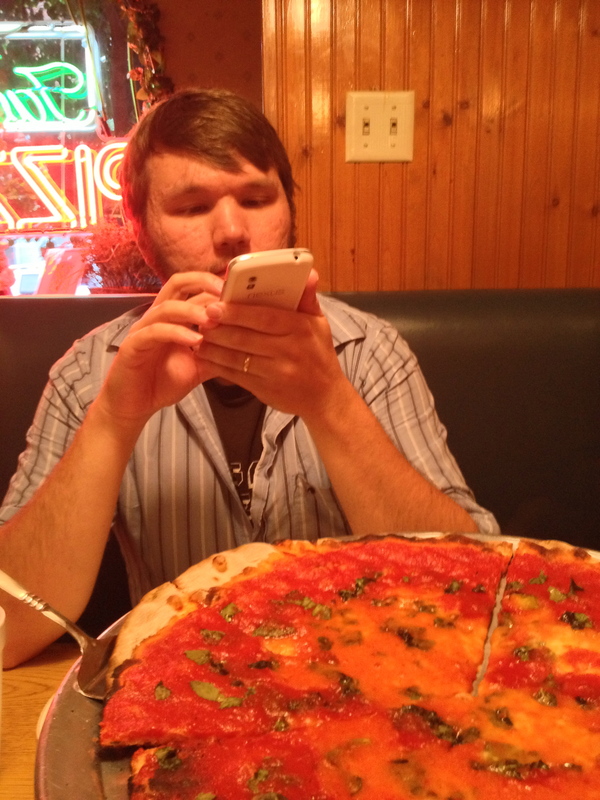 My friend Joe Moore is from the Jerz, and had not had really any good pizza in the Philly area. Every time he would say that, it occurred to me to mention Tacconelli’s and then I would forget. We finally got it together and got on over there. Now, you have to understand, Joe is no ordinary pizza shmoe. He is what would call a connousseur of pizza, a lover of the pizza pie. He was also really excited about the outing, as was I! We decided on getting the Regular pie (with a little cheese and sauce) and a Margherita pie (with fresh basil and fresh mozzerella) and a third pie with pepperoni. All of the pies were great! 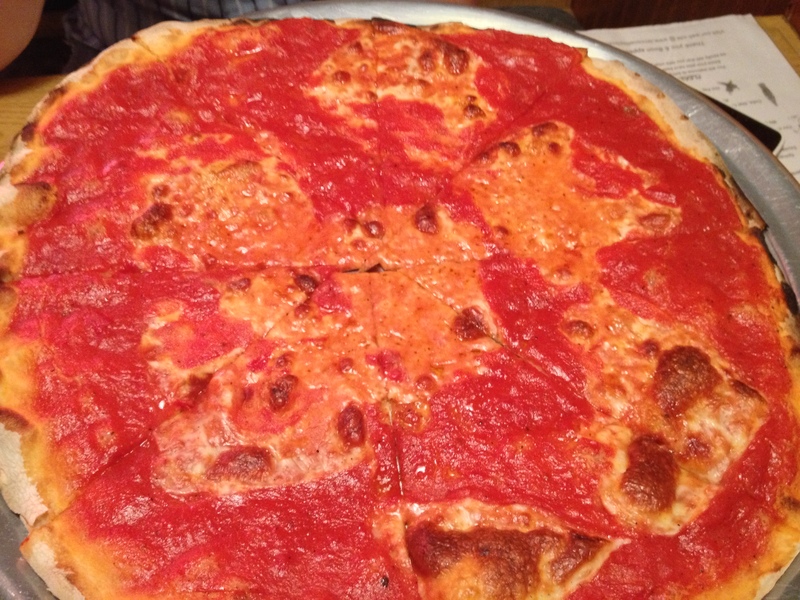 The thin crunchy crust was perfect, and Joe was surprised by the sweetness of the sauce. I liked that the pepperoni was sliced a little thicker. 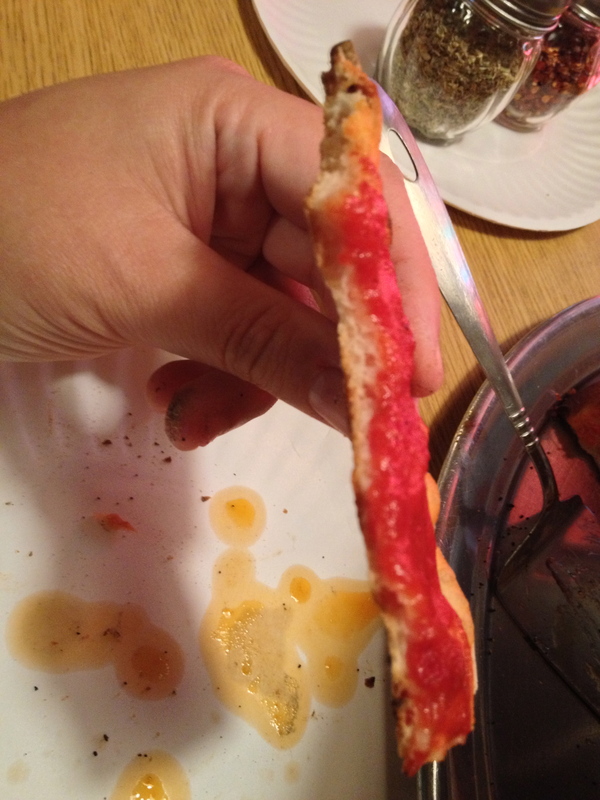 Some places slice it super thin (or, I should say, buy thin sliced pepperoni). 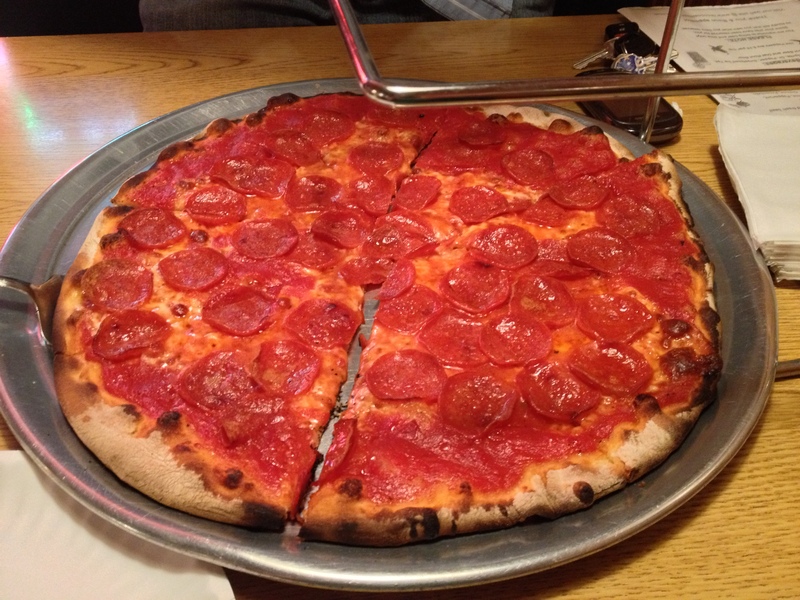 It may have added grease, but pepperoni grease is delicious (you know it, I know it and everyone else knows it). As you can see in the picture here, the crust is super thin, so you can really put away a lot of this pizza. In fact, we put away about 75% of it. I don’t know about Joe, but I had to actually stop myself from eating because I would have gone on and mowed through the rest of it (thank god we saved some for his wife Emily, or I would have really hurt myself). If I had to pick a favorite, I would have to say the pepperoni one was the best, but the Margherita wasn’t bad either. The pepperoni pieces were smaller then you would get at a regular pizza place, but they were a tad thicker and they are not stingy with it. If you are a regular reader at all of this blog, you know I hate stingyness! 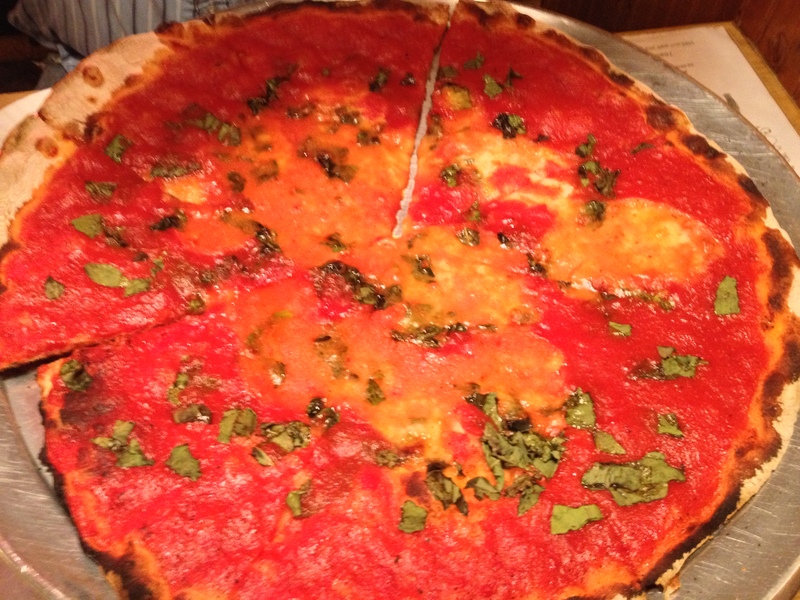 The fresh basil on the Margherita really gave it some depth, even tho I could have done with more of it. The problem with basil is that too much and you end up with everything tasting like basil (and not this Basil). Overall it was delicious, thin, crispy and slightly sweet. I had heard a lot about Tacconelli’s pizza and was pretty excited to finally try it. The establishment itself has all the hallmarks of a great pizza place – it’s in a mostly residential neighborhood and it feels like your friend’s grandma’s house with booths. It’s also worth noting all the of the waitstaff was super nice here. Simple menu which is a good sign – I want a place that spends their money on making an awesome pizza, not on order high-glossy prints of pizzas that resemble nothing from their kitchen. I always get the the plain whenever I eat at a new pizza place. That’s where the money is – a pizzeria can live and die by their plain pie. The first slice I had at Tacconelli’s was one of the best balance of sauce/cheese on one of the thinnest crusts I’ve had in Philly. The taste is also exceptional. At times it can be a little too salty or a little too sweet and sometimes both at once. But that’s something I can live with. Overall, it’s one of the best pizzas I’ve had in Philadelphia. So there ya have it! Keep an eye out for our next pizza adventure coming soon!